Luaus are traditional feasts in Hawaii and are usually held outdoors. A whole pig is roasted in a pit in the ground and foods such as yams, bananas, mangos, papayas, pineapple, and poi (mashed taro root) are the most popular foods to be served. Along with food comes music and entertainment, where ukuleles are played and women dance the hula. Hula dances tell stories about nature and the beauty of the sand, sea, and swaying palms. As you study America’s 50th state, Hawaii, plan a luau with your preschoolers. Here are five simple activities – one for each day of the week. Keep all your projects until the end of the week when you have your luau party in class. Leis are colorful garlands of flowers that are worn around the neck. They express the "aloha" spirit of Hawaii which is friendship and love. Styrofoam egg cartons can be re-purposed into Hawaiian leis following these directions. Cut apart the cups from the egg carton. Styrofoam egg cartons usually come in colors of white, pink, yellow, and green. The children can add decorative designs to the flower cups with crayons. An adult can poke a hole in the bottom of each flower cup. Cut the carton lid into small squares to be used as spacers between the flowers. Take a length of yarn (about 24-inches) and wrap a piece of tape on one end to make a pretend needle. Tie a knot in the opposite end of the yarn. Invite the children to thread alternate flowers and squares onto the yarn. When finished, tie the ends together. 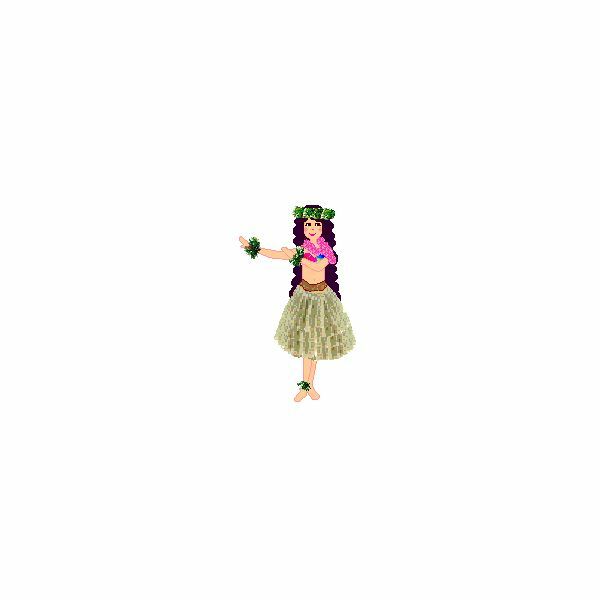 The hula skirt can be worn by all children for your preschool luau party, so make sure each child makes one. Purchase one-inch wide green ribbon and green crepe paper streamers for this project. Cut a length long enough to go around the child’s waist and extra to tie it. Lay the ribbon down on a table or on the floor. Show the children how to glue green crepe paper streamers (previously cut) to the ribbon to make a skirt. When the hula skirt is dry, it will be tied around the child’s waist. Use cardboard strips (about 2-inches wide) to make this Hawaiian floral headband. Make sure the strip fits the child's head. Invite the children to cut green leaves from construction paper. Have them glue these leaves around the headband. Next, have the students make flowers with white tissue paper wads (using the same technique as in the shakers) and glue these white blossoms around the headband in between the green leaves. When finished, staple the headband to fit the child's head. It's best to place a piece of tape over the staple to prevent scratches or pulled hair. An uli uli is a shaker used in traditional Hawaiian dances. It’s more of a rattle-type shaker with seeds or beads placed inside, and used similar to a tambourine to provide rhythm to the music. It is decorated with flowers. Here is a simple replica to make in class. Collect canisters with lids, such as Pringles potato chip cans (one for each child). Place pebbles or large beans inside the canister and put on the lid. Secure the lid with tape. Glue or tape red construction paper around the canister. Cut two cardboard circles (about 5-6 inches) for each side of the shaker. Show children how to wad small squares of red tissue paper and then glue these onto the cardboard circles. Cover the entire side with these paper wads until the area is covered. These paper wads will replica flowers. Make one circle for each side of the shaker. When thoroughly dried, glue these circles to each end of the shaker. Children can hold the uli uli shaker in the center and shake, shake, shake! After you have completed your luau projects this week – it’s now time to celebrate. Let the children help you prepare the feast by peeling and cubing tropical fruits such as bananas, papayas, mangoes, and fresh pineapple. Use plastic knives and be aware of kitchen safety rules. Arrange the fruits on individual paper plates for each child. Sprinkle the fruits with flaked coconut. Have the children dress in their Hawaiian outfits (made above) and enjoy their luau party listening to Hawaiian music, eating a tropical feast, and dancing the hula. Teach the children this simple song to the tune of “Happy Birthday” – Aloha means hello and goodbye!